Stormwater runoff is water from rain or melted snow that “runs off” the land instead of seeping into the ground. In urban areas, there is often an increased amount of stormwater runoff due to the amount of impervious surfaces (streets, parking lots, driveways, etc.) that prevent stormwater from naturally soaking into the ground. As it flows over land stormwater can pick up debris, chemicals, dirt, animal wastes, and other pollutants. These contaminants are then transported with the stormwater through the municipal separate storm sewer system (MS4) into local streams and rivers. Polluted water creates numerous costs to both the public and to wildlife. As in most communities, the catch basins and inlets located throughout the Borough of Middletown are connected to an MS4 which transports, but does not treat stormwater. Therefore, anything that enters the storm sewer system is discharged untreated into the Swatara Creek or Susquehanna River. Is the Borough Municipal Separate Storm Sewer System (MS4) regulated? Yes, the federal Clean Water Act, National Pollutant Discharge Elimination System (NPDES) permit program requires communities across the country to take steps to reduce polluted stormwater runoff. 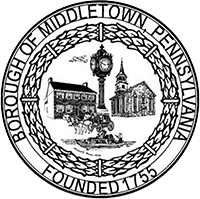 The Middletown MS4 permit outlines steps the Borough must take to improve the water quality within the Borough as well as for those living downstream.